In a bid to improve and supplement its accommodation facilities, Sheraton Denarau Villas has done a major investment in its Wet Edge restaurant. Various stakeholders of the tourism fraternity were hosted at the re-opening of the eatery this past Friday. Multi Property vice president Fiji and Samoa Marriott International and general manager Westin and Sheraton Resorts Fiji Complex, Neeraj Chadha confirmed the investment is worth around $1m. “We are trying to create reasons for people to come here,” he said. “It’s not just international customers that they have quality experience which is similar to any meals or quality outlets that they have in oversees. “But also for our locals to come here and start using an outlet which they feel and the pricing is very apt. “We have quality dining experience with a good pricing. “Obviously when it comes to other hotels here it also gives them the option to come and dine over here. “The structure of extension is brand new. “We have fixed the kitchen and bar. “Modernise it, so we can use that space for evening dining and functions. 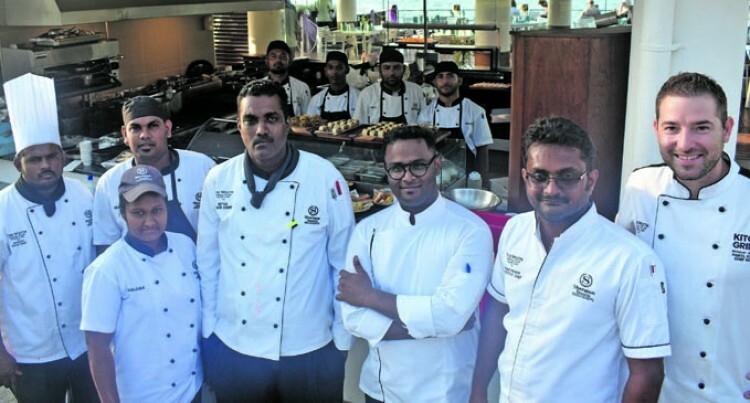 Complex executive chef at Marriott Denarau Fiji Complex (Sheraton Resort, Sheraton Denarau Villa, Westin Resort and Denarau Golf and Racquet Club), Prabhat Kumar Prawin said their commitment to serving locally grown, fresh and healthy food is where the menu concept ‘Farm to Fork’ originates. “All produce that is not grown on our resort farm has been sourced from the local agricultural community. By offering fair market prices, we provide the stimulus for growth and development,” he said. Sheraton Denarau Villas Board of owners chairman Alan Stewart was impressed with the investment. Mr Stewart said: “Now we have wonderful functions that can be used for lot of activities not for just evening meals, we have a wonderful solidity. Meanwhile, a fashion parade was hosted to mark the event as well.